The Enterprise: The Coterie Tea Room is a traditional tea room nestled in the heart of the historic town of Rye, serving wonderful freshly made sandwiches and cakes. By choosing to eat here with us you are making a difference to people's lives. 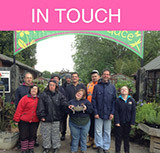 The benefits: 20 years in operation and a great reputation, great service, good quality and value for money and the added benefit of supporting people with learning disabilities to live more independently. The kitchen and serving staff are in supported development; working towards qualifications that lead to greater independence. Not a bad thing to be doing whilst enjoying a slice of cake. So when in Rye why would you go anywhere else? Come along for a warm welcome and some good food in a relaxing environment.